It was called Szechuan Sauce. For almost two decades, the sauce was thought to be a relic, a part of fast food history that would be fondly remembered alongside the Arch Deluxe, McDLT, and Chicken Selects. However, the creators of Adult Swim's 'Rick and Morty,' a sci-fi animated comedy featuring inter-dimensional travel, would not let the sauce remain in the past. The show made a campaign to bring back the Szechuan Sauce, even saying it would last as a nine season storyline on the show. 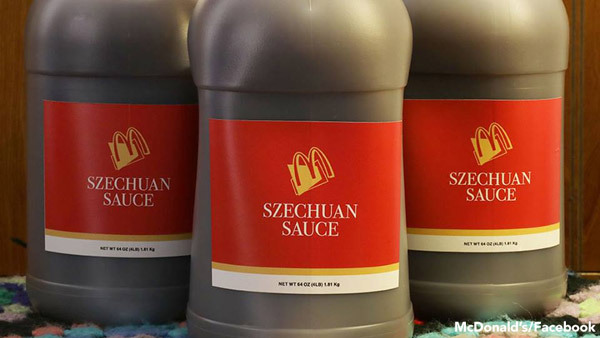 But when Michael Haracz, McDonald's Manager of Culinary Innovation, nicknamed Chef Mike, heard there was an outcry for the resurgence of the popular dipping sauce, he gave Rick, Morty, and many non-animated beings hope, tweeting back in April, "I'll see what I can do." But would the Szechuan Sauce truly ever see the light of day again? On early Sunday morning, the world got its answer. Justin Roiland, co-creator of 'Rick and Morty,' tweeted the photographic proof. Four photos, one of a case reading 'Dimension C-1998M,' one of a letter from Chef Mike, and two of a 64 ounce jug of the Szechuan Sauce. 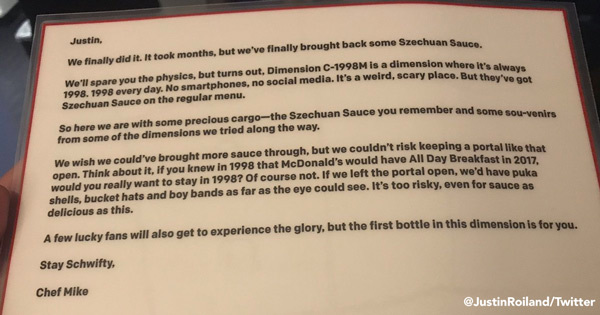 "McDonalds literally sent us a bottle of the Mulan sauce with a Rick & Morty label. This is insane," the 'Rick and Morty' Twitter account posted. The letter from Chef Mike was full of 1998 references. "We finally did it. It took months, but we've finally brought back some Szechuan Sauce. We'll spare you the physics, but turns out Dimension C-1998M is a dimension where it's always 1998. 1998 every day. No smartphones, no social media. It's a weird, scary place. But they've got Szechuan Sauce on the regular menu," Haracz wrote. Haracz explained (jokingly) that they could only bring back a small supply of the sauce because they didn't want to leave the portal to the 1998 dimension open or else "we'd have puka shells, bucket hats, and boy bands as far as the eye could see." "A few lucky fans will also get to experience the glory, but the first bottle in this dimension is for you." Yes, while 'Rick and Morty' creators can enjoy the Szechuan Sauce now, it looks like everyone else will at least get an opportunity to eat like it's 1998. Just hours later, it appeared McDonald's answered that question. The company posted on social media a photo of three more 64 ounce bottles of Szechuan Sauce with the caption, "SOS 073017 2130EST TWTR 3x.5GAL." McDonald's points out in the photo of the three bottles, supplies are limited, saying, "75% of all our Szechuan Sauce in the universe is in this picture." The cryptic message left many wondering if this was a hint about a Sunday night contest or was it about the 'Rick and Morty' Sunday premiere? It did appear to imply those interested in the sauce should check back on Twitter Sunday at 9:30 p.m. But was this just a publicity stunt joke for the cartoon's return or a real company issued contest? McDonald's would give this statement: "You'll have to wait and see. For now, only a limited amount of Szechuan Sauce got through from the always-1998 dimension. Who knows where space-time will take us because when our customers speak, we listen." So those craving Szechuan Sauce since 1998 will have to wait a little longer to find out. Meanwhile, Disney, the parent company of this ABC station, has planned a live-action version of 'Mulan' to open in theaters on November 2, 2018. There is no word if another Szechuan Sauce promotion is in the works.